Should Marriage Have A “Sell By” Date? In the months leading up to our wedding some 13 years ago, my husband and I had a series of meetings with the priest and the rabbi who were to preside jointly over our ceremony. These weren’t exactly pre-cana classes – more like a series of “getting-to-know” you sessions – but they were thought-provoking all the same. Having lived in Mexico for a bit of time, I’m fairly certain that this bill won’t pass muster in this heavily Catholic country. But it’s certainly an idea worth taking on board, in Mexico and elsewhere. I consider myself to be a happily married person. But I also know that I’m a minority. Many of my close friends and family members have split from their partners, some bitterly so. And many of the couples I know who have stayed together clearly regret that decision. As I’ve stated before, I’m not pro-divorce. But the statistics speak for themselves. While divorce rates have been dropping over the past 20 years in the U.S., it’s still the case that for the average couple marrying for the first time, the lifetime probability of divorce or separation remains between 40 and 50 percent. These days, researchers speak of a “three year glitch” (as opposed to the “seven year itch”) in estimating the average time before a couple begins to grow sick of one another. And still – curiously, almost blindly – we continue to idealize marriage. To be sure, some interesting alternatives to marriage are surfacing on the horizon. Co-habitation has doubled in the U.S. in the last 15 years among 30-44 year olds. In Canada, the new buzzword is LATS, which refers to people who live apart but remain in long-term, committed relationships. According to the 2001 census, one in twelve Canadians falls into this category. Alongside these innovations – and for the old-fashioned amongst us – we could also make marriage – like so many other contracts we enter into – fixed-term and renewable. In today’s world, that seems not only practical, but desirable. 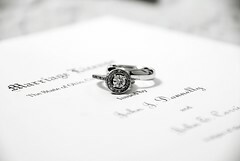 Image: Ring Shot by Corey Ann via Flickr under a Creative Commons license. I do! I think this is a very reasonable idea, and one that might mitigate the shame and social stigma still heaped on many people who divorce — even those who are leaving abusive relationships. It is just ridiculous that in this day and age divorce is still considered a shameful thing, while people cheer on any marriage. I high school kids should be required to take courses in family systems and child development — a little education might go a long way in helping people pick the right partners to begin with, as well as to be more realistic about life. I do – think this is a brilliant idea! It means that you don’t get to be on your best behaviour during courting or even living together and then become your true self after the hooks are in. I’d have wasted far less time in either of my first two marriages. Then again, I might have married a lot more times, who knows? And two years is probably not long enough for most folks who throw giant parties and spend a fortune to even pay off the debt! Would your friends get together every two years or so for such an event? It certainly bears thinking about the pros and cons! The main thing about marriage that irks me is that it’s a legal contract and the terms are defined by the state – you don’t have the option to modify it much, other than perhaps via a prenup, which aren’t last I heard legally enforceable here in the UK, though a judge would take it into consideration, apparently. No idea what the divorce experience here in the UK is like, though I gather it takes a lot longer, and would prefer not to find out anything first hand. I have often said that at least divorce should not lead to total cultural shunning, as happens in well-to-do, well-meaning geographies where children come first. Makes life harder on the children, those ostensibly at the forefront of our concern. @pauline – I couldn’t agree more. We teach them how to drive and other “home skills” – why not how and whether to marry? @ shelley – yes I think a big part of the problem is that marriage is both civil and, often, religious. Maybe it should just be one or the other? @ lisa-yes, yes, yes. There have been some great pieces (see link above to me not being pro-divorce) which touch on precisely this topic. thanks all! My wife and I renew our vows every seven years whether we need to or not. We’ll skip year 49 and renew on our 50th. Our primary goal for this is to yes, re-exclaim our committment to each other, but it’s also a terrific opportunity to throw a big party, invite all our friends (especially those we’ve met since the first wedding) and then take another honeymoon. Our first honeymoon was to Grand Cayman, so we try to hew to the “Grand C” motif. The second time, we went to the Grand Canyon. The third time, we went to the Grand Canal in Venice. In two years, we’re heading to the Grand Canyon of the Pacific on Kauai. I just hope we’re not reduced to visiting the Grand Concourse in the Bronx one day. Even with these elaborate preparations, marriage really only requires one thing — never take your spouse for granted. Our pre-nuptial agreement is the most worthless piece of paper we ever bought, because we’ll never, ever invoke it.